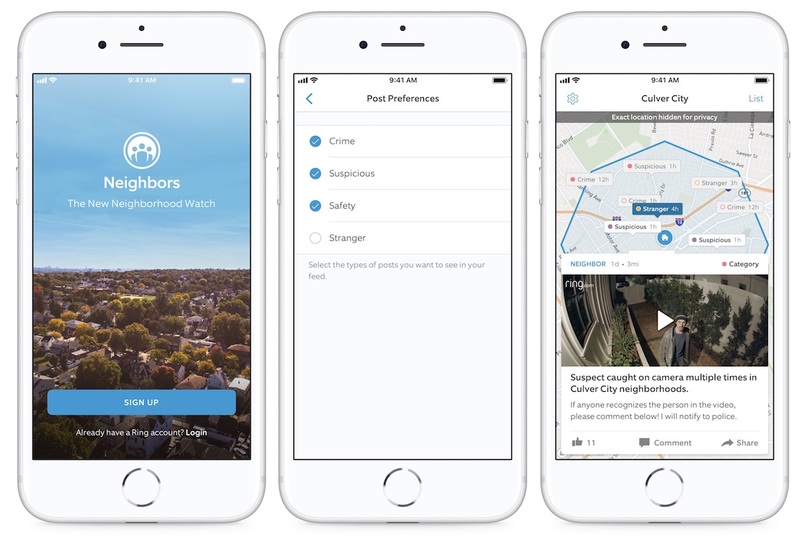 Ring today launched a standalone "Neighbors" app on iOS [Direct Link] and Android devices, pulling out the local security and crime-prevention feature from the main Ring app into a standalone experience. With Neighbors, Ring connects users in a nearby area who own any model of the Ring doorbell, and allows them to upload footage of criminal activity to make it easier to prevent and catch package thieves, burglars, and more. Users can scroll through their Neighborhood's recent feeds to check out potential crimes and other safety posts shared by nearby Ring owners and the Ring team. Feed posts include text, photo, or video alerts captured via Ring doorbells. The app can warn users about topics like Crime, Suspicious activity, Safety warnings, and Strangers wandering around. Jamie Siminoff, Chief Inventor and Founder of Ring, said: “At Ring, we come to work every day with the mission of reducing crime in neighborhoods. Over the past few years we have learned that, when neighbors, the Ring team and law enforcement all work together, we can create safer communities. Additionally, police and sheriff's departments throughout the United States are now joining Neighbors in an expansion of the crime-stopping program. Local law enforcement will be able to share real-time crime and safety alerts with their communities, and users will see the updates in their Neighbors feeds, which also includes an interactive map. The debut of a standalone Neighbors app follows Amazon's acquisition of Ring in February, and a price drop to $99 for the Ring Video Doorbell in April. In the wake of the acquisition, Ring promised customers that HomeKit support is still coming, stating that the Ring Pro and Floodlight Cam are currently being tested for HomeKit, "and as soon as testing is completed" the company will "update everyone with a release date." Neighbors by Ring is available to download for free on the iOS App Store [Direct Link]. So big brother can watch you making out in your front porch(just an example)...not sure how privacy laws come into play on this slippery slope. People with Ring devices can manually share a video clip of suspicious activity to their nearby "neighborhood." Then, anybody that has this app and is associated with the same "neighborhood" can be alerted that there is suspicious activity nearby. That's it. If you're concerned that people in your "neighborhood" could view your device at any time, that's not how this works. In order for others to see your camera(s) feed(s), you need to explicitly grant them access through the app. Um, if you're already making out on your front porch, couldn't your whole street already see you out there? There's still some sort of information that you can get in plenty of instances that can be more useful than no information at all. Yes, I agree with you. And it is a deterrence too, which may discourage theft in the first place. I mostly meant to speak out to the "invasion of privacy" people, so I used their "hugging wife" and "kids in front yard" examples. Besides not understanding how this works, why are you on your front porch making out where any random Joe strolling along could see you? If you’re that concerned about it, perhaps you should take it to the backyard or inside. Trust me, no one wants to see that anyway. Bye-bye privacy… is this like a Big Brother in your front yard? And law enforcement couldn’t care less about your packages being stolen from your porch anyway. As to communicating crime, they already do through opt-in into their warning system. I can imagine these people alerting neighbors that there’s a black guy or a Hispanic family walking around the neighborhood just going about their business. Do you know all your neighbors on your street? No, so why would you assume they’re not your neighbors !! This thing is so wrong on multiple levels… typical of the “guilty until proven innocent “ mentality this country fell into. Have you privacy people actually seen videos from these things? They use wide angle lens (fisheye) cameras in an attempt to have as much coverage as possible, which makes everything super tiny and distorted. The only way you could identify someone is if they were within a few feet of the camera. At any appreciable distance, even just across the street, it is literally impossible to identify someone. I've seen my neighbor's 1080p HD video of his boat being stolen (parked on the street in front of his house). You can't make out any license plate number, and you can't even make out the skin color or gender of the people stealing his boat. By the time the distance includes crossing the street and a yard to a porch where you are hugging your wife or whatever, it's going to be vaguely possible to see that there are two human beings, and that they might be hugging, and even only that under good conditions. Guys, that is just one example I gave. If I don’t explicitly give my neighbors permission to record whatever I do at my own house’s porch, it is not okay for them to record or replay from their door where they can see my house. If you're outside (on your property or not), you should have no expectation of privacy. At the end, we are not going to agree on the issue. Since you find it acceptable to have your neighbor looking at you and recording 24/7 while you and your house is in their plain view, meanwhile I find it absurd that I can't let my guard down even at the comfort of my own darn home whether inside or out, knowing that some creeps may be looking at and constantly recording whatever the heck I am doing at my place AND share it with others without my permission. And if you want to get fancy, they make these things called curtains.